Imaginative, enthralling and action packed, this is Sammo Hung at the height of his powers, creating a riotous martial arts classic many would argue to be the greatest kung fu movie ever made. All the genre hallmarks are here – revenge, loyalty, slapstick comedy, a narrative inspired by a real Chinese folk hero and a primary focus on one specific style. Sammo’s chosen folk hero is Foshan legend and Wing Chun master Leung Jan. Leung Kar-yan (in perhaps the best performance of his career) betrays his youthful looks to play the respected hero in his old age. He’s the sifu of the buffoonish Chun (Sammo) and medical adviser to young bank clerk Cashier Hua (Casanova). After overhearing the evil Mo (Fung Hark-on) explain to his cronies about his plight to take over Foshan, Hua is beaten and hunted by Mo’s rabble of chopsocky misfits, forced to seek refuge with Leung Jan. Jan teaches the boy Wing Chun in order to combat his adversaries, eventually stepping up to take revenge when his master is slain in an intense tea shop brawl. The cast is fabulous, particularly overlooked Korean actor Casanova Wong who was never given the opportunity to capitalise on his burgeoning success. 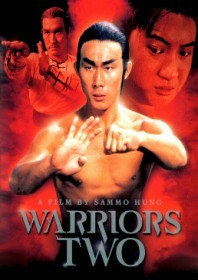 The cartoon villainy of Lee Hoi-san (master of the Iron Bell technique), Yeung Cheng-wu (playing a long haired superkicker), Yeng Wei (a deadly spearman), and Dean Shek (an irritating clown) all offer stern support, not to mention the Mantis twitchings of Fung Hark-on who is eerily sublime. The final brawl is an insane, extended climax – one of the all time greats – and although the entertainment value of this film has since been equalled, Warriors Two has yet to be surpassed for its sheer skill and audacity. Sammo Hung’s more revered 1981 film The Prodigal Son, detailing the early years of Leung Jan, acts as a prequel to this film. Es la mejor historia despues de yuen chia!!!!!! !